is a true Renaissance Man. Equally at home in a shark cage feeding great whites in Australia, rappelling into New Mexico's fabled Lechugilla Cave, or white-water rafting the length of the Zambezi's Batoka Gorge, Foster lives a life that is just as adventurous as his fictional heroes. 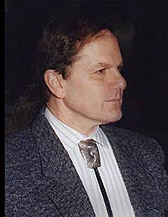 Born in New York City, Foster was raised in Los Angeles. His love of science fiction started when he was a boy. His father read science fiction, and his books were always lying around the house. His uncle, Howie Horowitz, a successful television producer of such series as Batman and 77 Sunset Strip, was a great fan of science fiction, and the young Alan absorbed that love of the genre. After receiving a Bachelor's Degree in Political Science and a Master of Fine Arts in Cinema from UCLA, he spent two years as a copywriter for a small Studio City, California advertising and public relations firm. But fiction writing was always his first love. He sold his first short story in 1968 to August Derleth for publication in Derleth's magazine, The Arkham Collector. Since then, Foster's sometimes humorous, occasionally poignant, but always entertaining short fiction has appeared in all the major SF magazines as well as in original anthologies and several "Best of the Year" compendiums. Five collections of his short form work have been published. His first big break as a writer came in 1970 when he sold his first full-length novel, The Tar-Aiym Krang, to Betty Ballantine of Ballantine Books. The Tar-Aiym Krang introduced readers to Phillip Linx (known to his friends as Flinx), an orphan with some interesting mental powers, who lives by his wits with his mini-drag Pip. The book was the first in the wildly popular Pip and Flinx series, which is set in the Humanx Commonwealth. The Commonwealth is populated by humans and alien species who share the Orion arm of the galaxy: not always peacefully. To date, Alan has published twenty books set in the Commonwealth universe, including Icerigger, Mid-world, For Love of Mother -- Not, Reunion, Phylogenesis, Dirge and Diuturnity's Dawn, several books in the popular Spellsinger universe, as well as numerous other stand-alone novels in many genres. Foster's work to date includes excursions into hard science fiction, fantasy, horror, detective, western, historical, and contemporary fiction. He has also written numerous nonfiction articles on film, science, and scuba diving, as well as having produced the novel versions of many films, including such well-known productions as Star Wars, the first three Alien films, and Alien Nation. Other works include scripts for talking records, radio, computer games, and the story for the first Star Trek movie, Star Trek: The Motion Picture. In addition to publication in English, his work has appeared and won awards throughout the world. His novel Cyber Way won the Southwest Book Award for Fiction in 1990, the first work of science fiction ever to do so. His books are known for their excellent characterization and dialogue, great imagination, adventure and subtle sense of humor. It was Icerigger that brought him to the attention of a young filmmaker named George Lucas, who had just finished the screenplay for his new feature film, Star Wars. In case the movie was a success, Lucas wanted fans to be able to immediately have more material set in the Star Wars universe, and not have to wait until the next film in the series came out. So Lucas contacted Foster, and set up a meeting at the Van Nuys office of Industrial Light and Magic. The two hit it off, and Foster agreed to ghostwrite the novelization of the film, Star Wars (Lucas was too busy making the film to write it), and to write a sequel entitled Splinter of the Mind's Eye. Lucas later gave Foster full credit as the author of the book, and hired him to write the just-released hardcover Star Wars: The Approaching Storm (Del Ray). The Approaching Storm is a bridge book between the films Star Wars: Episode I --The Phantom Menace and Star Wars: Episode II -- Attack of the Clones, which will be released in May, 2002. The Approaching Storm follows the adventures of Obi-Wan Kenobi and his young Padawan, Anakin Skywalker while on a diplomatic mission to the planet of Ansion. Foster was given the task by LucasFilms of not only explaining the political background which leads up to the events in Episode II, but of exploring (in the way only a book can) the thoughts and motivations of Anakin, the troubled young Jedi who will eventually become Darth Vader. When he's not writing, Foster and his wife JoAnn Oxley love to travel the world over, especially to exotic locales. They have traveled to Europe and throughout Asia and the Pacific, in addition to exploring the back roads of Tanzania and Kenya. Foster has camped out in the "Green Hell" region of the Southeastern Peruvian jungle, photographing army ants and pan-frying piranha; has ridden forty-foot whale sharks in the remote waters off Western Australia, and was one of three people on the first commercial air flight into Northern Australia's Bungle Bungle National Park. He has driven solo the length and breadth of Namibia, crossed the Andes by car, sifted the sands of unexplored archeological sites in Peru, gone swimming with giant otters in Brazil, named previously unexplored dive sites in Tuvalu, and surveyed remote Papua New Guinea and West Papua both above and below the water. His filmed footage of great white sharks feeding off South Australia has appeared on both American television and the BBC. Besides traveling, Alan enjoys listening to both classical music and heavy metal. Other pastimes include basketball, hiking, body surfing, scuba diving, collecting animation on video, and weightlifting. He studied karate with Aaron and Chuck Norris before Norris decided to give up teaching for acting. He has taught screenwriting, literature, and film history at UCLA and Los Angeles City College, as well as having lectured at universities and conferences around the country and in Europe. A member of the Science Fiction Writers of America, the Author's Guild of America, and the Writer's Guild of America, west, he also spent two years serving on the Planning and Zoning Commission of his home town of Prescott, Arizona. Foster's correspondence and manuscripts are in the Special Collection of the Hayden Library of Arizona State University, Tempe, Arizona. The Fosters reside in Prescott in a house built of brick salvaged from a turn-of-the-century miners' brothel, along with assorted dogs, cats, fish, several hundred houseplants, visiting javelina, porcupines, eagles, red-tailed hawks, skunks, coyotes and bobcats. Alan spoke to us about his new novels, Diuturnity's Dawn (Del Ray) and Star Wars: The Approaching Storm (Del Ray) and how he creates his memorable characters. He also give some great advice for aspiring writers. My senior year at UCLA, when I sold a couple of short stories. I thought it beat the hell out of becoming just another lawyer. In 1970, Betty Ballantine bought my first novel, The Tar-Aiym Krang. Was there anyone in particular who supported you or inspired you in your writing? Nope. My family were all primarily business people. No writers, composers, painters...nothing. I just kind of sprang out of nowhere...an interstellar Topsy. I'd first like to talk about The Approaching Storm. What special challenges did this book present? It's always a challenge to work in someone else's universe. One of the hardest things to do is force yourself to make the characters you're writing about conform to the templates set down by the originator, instead of re-writing them to suit your own particular take. Did you read the final shooting script ? Yes...had to. But bear in mind that changes were made to the finished film subsequent to the script version that I was read. In the book, we learn much more about the inner turmoil that Anakin feels, and which is going to lead to so much trouble down the road. You really have the first crack at his personality, because the book was released before the film. How did you approach writing Anakin? Was there anything that you consciously had to avoid doing with his character? At the time of The Approaching Storm I saw Anakin as a troubled teenager verging on a confused manhood. He's dealing with a lot of issues, far more than your average late teen, and also far more than the usual Jedi padawan. There was a distinct balancing act to try and maintain while writing him: showing him confused and conflicted while still keeping him a would-be Jedi and a sympathetic character. Yet...we know he is to become Darth Vader, and those aspects of his personality that would allow him to fall that way also had to be brought out, or at the very least, hinted at. The book has some very interesting insights. One of the Alwari characters notes at the end of the book that even though the Jedi are so powerful and spiritually centered, he actually feels sorry for them because of the solitary lives that they lead. Did your view of the Jedi change after writing this book? How much leeway were you given when writing about the interior thoughts of the Jedi? Solitary "hired guns", much less celibate ones, by definition lead lonely lives. Remember the unbeatable Samurai in Kurosawa's Seven Samurai who lived only to perfect his art. There are rewards in such a life, but also a great many sacrifices. That's how I always saw the Jedi. I see their mission as giving up a normal life in exchange for protecting the innocent. It's a life of sacrifice. There are rewards, but also a certain degree of sterility. I had complete leeway in writing about "the inner thoughts of the Jedi"...so long as I didn't contradict Lucasfilm's accepted standards for what and how a Jedi should think. 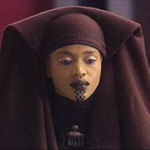 The Jedi Master Luminara Unduli is an unusual and entertaining character. How did you create her character -- were you given much guidance as to her? No guidance at all. Just a name and a couple of artist's renderings. I wanted to make her as different from the more familiar Jedi as I could without overstepping the bounds I alluded to in the previous question. It's unreasonable, for example, to expect a female Jedi to think exactly like a male Jedi...or an alien one...in every situation. Much of the action takes place as the two Jedi and their Padawans cross the plains of Ansion, in search of the Alwari. What were your influences when writing about these sections of the book? There was a wonderful, almost an Old West feel about the journey. Thank you. I've always been attracted to the history of nomadic people who've struggled to cope with modernity while simultaneously maintaining their ancient traditions. It's not an easy trick to pull off. With the Alwari, I wanted to try and do it. As a movie reviewer and media critic for SF Chronicle, what are some of your pet peeves in SF/Fantasy films? Lack of attention to detail. You get a futuristic starship operated by standard keyboards, for example. Or a city fifty years in the future still uses the same kind of telephones. That sort of laziness on both the writer and the producer's part. No attempt to modify the language...everyone speaks standard current English. Everyone wearing uncomfortable high-necked clothing, or attire that's obviously wrong for the place and time. What were your favorite films of 2001? Did The Lord of the Rings deserve the Oscar for Best Picture? I think that it did, especially with the way the makers of A Beautiful Mind copped out on John Nash's real life. I loved Shrek, and was very fond of K-Pax. I'd also like to talk about your latest release, Diuturnity's Dawn, the third book in the trilogy about the founding of the Commonwealth. The format is complex, with three totally different storylines which eventually converge. What went into your decision to craft the story that way? I try to challenge myself as much as possible, as often as possible. Structure-wise, I wanted to do something different from the preceding two books in the trilogy. Having read them, the tripartite story structure in Diuturnity's Dawn could not have been anticipated. Readers deserve surprises, even in sequels. Also, history is replete with great events that result from a concatenation of seemingly unrelated incidents whose relationship is often only discernible in hindsight. One of the book's major plots involves a chilling description of the activities of a group of terrorists who are intent on disrupting an intercultural fair, the purpose of which is to promote relations between two alien races. I was uncomfortably reminded of the recent terrorists attacks, as well as the increasing number of protests against globalization that occur whenever there is a conference on world trade. I assume you wrote this book before 9/11; what was your inspiration for writing about the terrorists? What was it like getting inside the mind of a terrorist? Yes, Dawn was written well before 9/11. People speak a lot today about the "banality of evil", but not all evil is banal. Some of it is carefully structured and well thought-out. That's where the real danger lies. In an engineer like the Egyptian Ayman al Zawahri who turns to terrorism. Getting inside the mind of a terrorist wasn't difficult at all. Even as children, human beings fabricate elaborate revenge fantasies. We're not a particular pacific species. Check out popular video games. One of the main protagonists of the story is the human diplomat Fanielle Anjou, a complex woman who faces some truly difficult decisions and has some terrible challenges to overcome. How did you create Fanielle? Professional diplomats tend to get short shrift in SF, unless they're ambassadors or something else exalted. Much of the real work of diplomacy is done by lower-level workers whose names never appear in the media unless they get shot or blown up. I wanted to depict the importance of that kind of work, the work that goes on every day behind the scenes: making contacts, supervising small projects, etc. These people are quiet heroes, just doing their jobs. That's how I saw Fanielle. One of the themes in the Commonwealth series that I see is what happens when dissimilar cultures clash and how events are shaped by the expectations (reasonable or not) of each of the parties. What do see as the main themes in the Commonwealth series? Or do you even think in themes when you begin to write? What personal views of yours do you feel are reflected in the book (about politics, war, love or just views on life in general)? "Read everything you can in your favored genre, including older work. Keep writing. Try to do a little bit every day, even if the result looks like crap. Getting from page four to page five is more important than spending three weeks getting page four perfect." The Commonwealth came about when I was writing my first novel because I thought it would be interesting if, when we go out to the stars, our best friends turn out to look like our worst nightmares (and vice versa...see Dirge). Pretty basic stuff about valuing people for what they are instead of how they look, and about the need to cooperate to succeed and survive. Judging individuals on intelligence and how they act. I feel the same way about life here on our one small ball of dirt. And as you know, I'm very concerned with ecology. There are so many books in the Commonwealth series. From an organizational standpoint, how do you keep all the characters and events straight? Do you use a special system? A number of years ago a couple of fans of my work, the artist Michael Goodwin and a writer named Robert Teague, put together a 64 page book called A Guide to the Commonwealth. I went through their ms., made corrections and updates, and have updated it ever since (you can see some of it on my website). That's my ongoing manual for keeping track of things. With the growth of the Commonwealth, its become increasingly difficult...but I try. When I make a goof, the readers let me know...immediately and vociferously. It's tough trying to make books written 30 years after The Tar-Aiym Krang, for example, fit every single event in that novel. I get up around 7:00 a.m., read the news on the Net, go over and over the chapter section I intend to write that day, and eventually plunge in...on the computer. I need as much silence as possible, though I can work with some background noise. No music...I get too involved in the music. I'm usually through with the actual typing by lunch time. In the afternoon I do research, expand on the story outline, go to the gym or do what needs to be done around the house. If I get nothing typed in the morning, then I'll continue on into the afternoon until I get at least a couple of pages finished. How would you say you have evolved as a writer since the publication of your first book? Living gives you a better understanding of life. I would hope that my characters have become deeper and more rounded personalities. Wider travels have given me considerably greater insight into how cultural differences affect not only people, but politics, art, etc. You are so prolific. Have you ever faced the curse of writer's block? If so, how did you deal with it? What effect have the recent mergers of major publishing houses had on the book publishing business and on the SF genre, in particular? Reduces the opportunity for new writers to break in. Advances have fallen, generally, for everything except the biggest potential bestsellers. Given all the changes, both economic and technological, SF hasn't done too badly. How important is music to you in your life? I prefer classical. I hear entire symphonies, oratorios, etc. in my head, but I can't write a note. Sometimes I'll orchestrate a piano piece, or bit of popular music, just for my own amusement. I also like ethnic music and heavy metal. What is your advice to the aspiring SF or fantasy novelist or screenwriter? Read everything you can in your favored genre, including older work. Keep writing. Try to do a little bit every day, even if the result looks like crap. Getting from page four to page five is more important than spending three weeks getting page four perfect. As an experienced traveler who has done everything from swimming with great white sharks to rappelling down cliffs, is there any travel experience that you still dream about? Oh, a great many. It's a small world, but a fascinating one. Number one on my list is to head an expedition to the mountains of Irian Jaya to follow up on an old Australian report of thylacine sightings. But it's not a good time to visit Irian Jaya (West Papua) right now.